The The AKE Juvenil Championship is a professional wrestling title promoted by AKE (Azteca Karate Extremo) in Tijuana. Skalibur is the current champion. 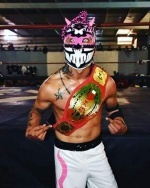 He defeated Rayo Star & Black Destiny in Tijuana, Baja California. This title was introduced by AKE on August 12, 2016 in the event Destrozo Total. There was a 4 Way Match for the vacant title won by X-Peria. The second champion was Fantastik. Mirage became the third champion. The fourth champion was Demencia. The fifth champion was Rayo Star. This page was last edited on 8 April 2019, at 18:05.